Share the facts about vinyl siding. Your input can help shape rules and regulations in your community. Let’s work together to protect homeowners and professionals from excessive regulations and keep high-quality, high-value exterior options open to everyone. Get the latest news on compliance, regulations and industry insight when you sign up to become an advocate for vinyl. You can help ensure that local and state governments make informed decisions on building materials by educating them on the benefits of vinyl siding and the needs of your business. Our Advocacy Kit makes it easy to get involved starting today. Take a stand to protect vinyl. 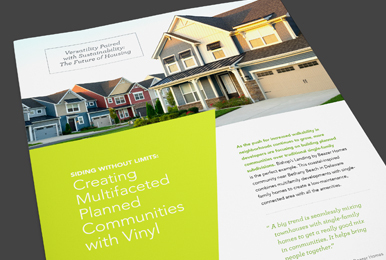 The newest, best and most relevant information on vinyl siding products and performance. See our top picks below, or filter by type to find the articles you need now. We all know about “the birds and the bees” talk we have with our children when they reach the appropriate age. For home builders and installers, there is a similar conversation they need to have with their clients that can be just as awkward as the “big talk” we have with our kids, especially if the homeowners demand eco-friendly materials for their home. The Congress for the New Urbanism chose Savannah for its 26th meeting because the city exemplifies the values of the New Urbanism, including walkability and traditional neighborhood design. Laboratory assessments have led to improvements in the manufacture of vinyl siding for high wind environments and strict installation standards that have become code requirements.